Yes, unfortunately we have to wait until April 7 for Beat The Champ, The Mountain Goats’ 15th LP, to be released in the U.S. While we patiently await John Darnielle’s ode to wrestling and “death and difficult-to-navigate interior spaces,” Darnielle is slowly releasing a few tracks off the new album. Today, Darnielle leaked “Heel Turn 2”. Let’s take a listen. Readers of the Music Court know that I am a big Mountain Goats fan. There is a reason why The Mountain Goats frequent my iTunes favorites list more than almost every band I have music from (second to the Beatles, which is a heck of a compliment). 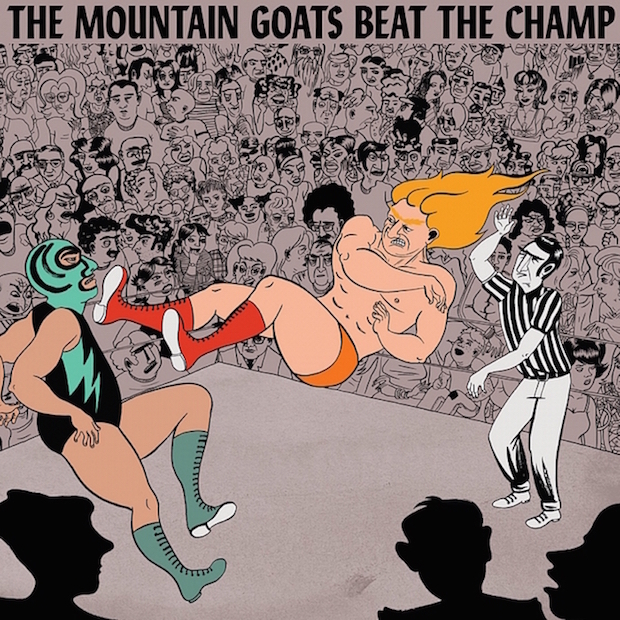 Beat The Champ is the first Mountain Goats release since 2012’s Transcendental Youth. The Mountain Goats do have the unique ability to record consistently incredible albums. It’s tremendous. Darnielle never has a let-down. “Heel Turn 2” is a classic Darnielle track. It bounces with a driving acoustic guitar and poppy percussion. This is supplemented with some creative instrumentation – lounge piano and ethereal guitar. It’s melancholic (“I don’t want to die in here” is a lyric) and dulcet. The song is almost split into two pieces – one a Mountain Goats standard and the second a lugubriously beautiful piano piece. Heck of a song!